Launch game with -nostartupmovies -nosplash parameters. Configuration files are encrypted except for the Apple OS X Steam port configuration files, which are unencrypted. Available filters are Default, Vintage, and Vibrant. Non-16:9 resolutions are anamorphic; use Flawless Widescreen to remove. Default FOV is 72°. See Field of view (FOV). Nvidia users can force MSAA and TrSSAA in Nvidia Profile Inspector with the Antialiasing Compatibility flag 0x080102C1. 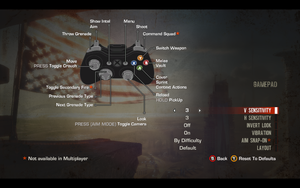 AMD users can force AA through AMD Control Center. 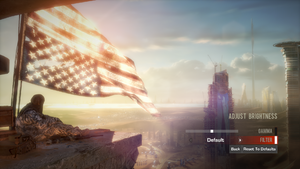 Flawless Widescreen can set the FOV up to 92° by default. 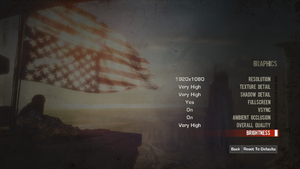 Download and run Flawless Widescreen. 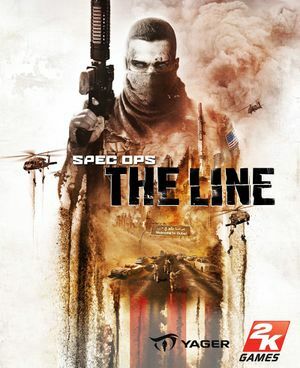 Install the Spec Ops: The Line plugin. Open the folder where Flawless Widescreen is installed. Edit SpecOpsTheLine.lua with a text editor. Find the line fAdditionalFOV = Sender:GetScaledFloat(5). Change (5) to (2) and save the file. Launch Flawless Widescreen and adjust the slider. 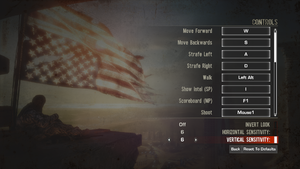 Do not run the game in borderless mode if using forced MSAA or TrSSAA settings. Run the game in fullscreen mode. Look for [Engine.Engine] class and edit MaxSmoothedFrameRate= to your preference. Multiple actions under one key (eg sprint/cover/context actions). See Mouse sensitivity to fine-tune. Find m_viewAccelEnabled=true change it to false. Find MouseSensitivity=60.0 and change it to a different value according to your preferences (many people find 30.0 a good value). Find m_targetingModeMouseViewScalePct=0.6 change it to 1.0. That way it will only scale with FOV which is good for muscle memory. Find bEnableMouseSmoothing=true change it to false. Music, Speech, SFX, Voice chat. 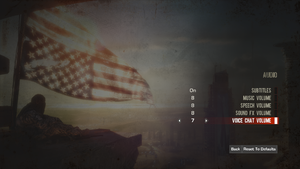 Most languages have the in-game option to select English audio. Extract the contents to <path-to-game>\Binaries\Win32\. Download the Bink Video 1.99r DLL. Go into "control panel" -> "hardware and sound" -> "device manager"
Right click Spec Ops: The Line in the Steam games list. Under Local Files, select Verify Integrity of Game Cache. This will reset all game settings, but save games will preserved. Unzip it in a handy folder. Such as %USERPROFILE%\Documents\My Games\SpecOps-TheLine\SRGame\Config\. Open the file you need to edit with Gibbed.SpecOpsTheLine.IniDecrypt.exe (drag-and-drop). Make the changes you want in the now unencrypted file. Open the modified file with Gibbed.SpecOpsTheLine.IniEncrypt.exe, thus re-encrypting it. This page was last edited on 15 April 2019, at 22:25.